Iranian President Hassan Rouhani offered help to Sri Lanka to carry out projects for development of the South Asian nation. Iranian companies are ready for involvement in and implementation of development projects in Sri Lanka, the president said at a meeting with his Sri Lankan counterpart Maithripala Sirisena, held in Bangkok on Monday. The two heads of state met on the sidelines of the 2nd Asia Cooperation Dialogue (ACD) Summit. Elsewhere in the meeting, President Rouhani hailed Iran and Sri Lanka’s identical stances and their support for each other in international organizations, calling for expansion of bilateral relations, economic ties in particular, following the removal of anti-Iran sanctions under the Joint Comprehensive Plan of Action (JCPOA), a nuclear agreement between Tehran and the Group 5+1 (Russia, China, the US, Britain, France and Germany). 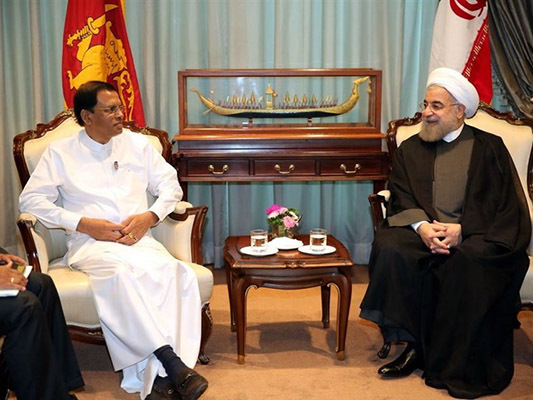 For his part, Sirisena acknowledged Iran’s role in the establishment of peace and stability in Sri Lanka, expressing his country’s resolve for boosting relations with Iran in all fields, mainly in the energy industry and agriculture. President Rouhani concluded his Southeast Asian tour on Monday, after visiting Vietnam, Malaysia and Thailand, where he addressed the ACD summit and held a number of high-profile meetings. The summit, entitled “One Asia, Diverse Strength”, was attended by senior officials from 34 Asian countries.